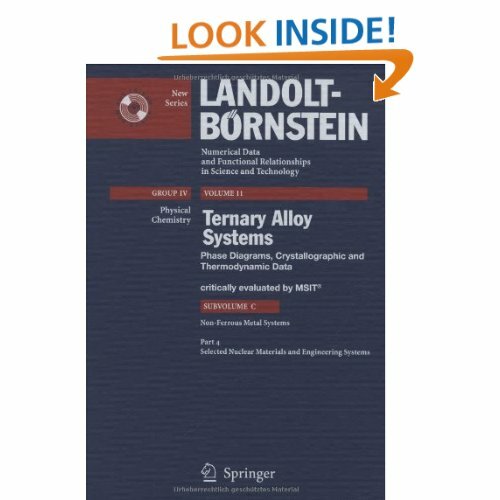 The present volume in the New Series of Landolt-Börnstein provides critically evaluated data on phase diagrams, crystallographic and thermodynamic data of ternary alloy systems. The often conflicting literature data have been critically evaluated by Materials Science International Team, MSIT®, a team working together for many years, and with expertise in a broad range of methods, materials and applications. All evaluation reports published here have undergone a thorough review process in which the reviewers had access to all the original data. The data for each ternary system are provided in a standard format which includes text, tables and diagrams. The topics presented are literature data, binary systems, solid phases, pseudobinary systems, invariant equilibria, liquidus, solidus, and solvus surfaces, isothermal sections, temperature-composition sections, thermodynamics, materials properties and applications, and miscellanea. Finally, a detailed bibliography of all cited references is provided. In the present volume IV/11C selected non-ferrous-metal systems are considered, especially selected nuclear materials and engineering systems in this Part 4.